Mumbai, July 15, 2010 – With more than 25,000 sales bookings registered since its launch in March, the Ford Figo has cemented its reputation as one of India’s most in demand new cars. “Reaching the 25,000 sales booking milestone in close to 100 days continues the Figo’s remarkable rise and rise in popularity among Indian consumers,” said Michael Boneham, president and managing director, Ford India. Targeting more than 70 percent of the country’s prospective new vehicle buyers, the popular Figo has helped drive growth in all markets (Tier I, II and III) across India. In the January-June period, Ford sales volume, on a year-to-year basis, doubled in Tier 1 markets including Mumbai (234%); Chennai (279%) and Delhi and the NCR region (223%). In terms of regional sales, there was a similar response – east (339%); west (277%), north (212%) and south (127%). Big gains – double, and in some cases, triple fold growth – were registered in Tier II markets such as Chandigarh, Ahmedabad, Pune, Kochi, Coimbatore, Indore, Bhopal and Jaipur and Tier III markets such as Dehradun, Trichy, Nashik, Aurangabad and Kanpur. 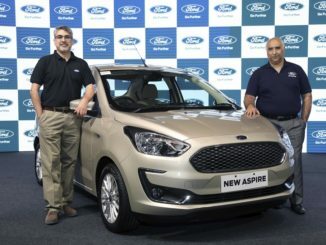 In addition to strong internal demand, Ford India has also recently celebrated it first export order of 1,200 Ford Figos to Ford Motor Company in South Africa. Overall, the Figo has helped Ford India record more than double the volumes of 235% year-on-year in half year sales, selling a total of 32,755 vehicles compared to 13,897 units last year. Consistently updating and enhancing the cost of ownership programme – for example, Figo is a market leader in terms of scheduled service over a 5 year/100,000 kilometre period. Other offerings include the Total Maintenance Plan (TMP) and Scheduled Service Plan (SSP) that allows customers to purchase extended service plans for regular maintenance items for up to 100,000 kilometres or five years, at reduced rates.